"This is a fantastic chance for our students to start to envision where they fit into the workforce after graduation," said ESF President Quentin Wheeler, of ESF's 13th Annual Environmental Career Fair. The career fair brings together representatives from a broad range of organizations that offer careers associated with the environment. This year's fair, held Feb. 26 in the Gateway Center, boasted 77 organizations that included national, international and local corporations, governmental and non-profit agencies. Christopher Debany, senior environmental science major, came prepared, dressed in a suit and tie with a portfolio of resumes. "Hopefully I'll see some job opportunities and learn what employers are looking for," he said. Prior to the event, Debany researched the companies he was interested in. Because his field of interest, geospatial analysis, is relatively new, he said "the bigger companies are familiar with that area and the smaller companies are interested in hearing how it could fit in with what their company does." "One of the best things we have at this career fair are the conversations," said Laura Nelson, environmental consultant with the Antea Group. "The students are prepared and can speak to the actual careers," said the '04 environmental studies graduate. "ESF has always been a fertile recruiting ground for us," said Adam Gersh of Arcadis. Arcadis, an international company providing consultancy, design, engineering and management services in the fields of infrastructure, water, environment and buildings, has a relationship with ESF that extends beyond the career fair. "We do a lot of mentoring with ESF's engineering department," said Arcadis' Cristina Albuino, '02 ERE. "I feel like every year we hire one or two ERE graduates. We try to keep a close connection." Albuino is a civil engineer with the company. Not only is the environmental focus of the career fair beneficial to students, but so is the variety of organizations in attendance. "I love that this is environmentally focused and there are a lot of different options - agencies, public and private sector - to stop at," said Alaina Mallette, a graduate student in environmental science. 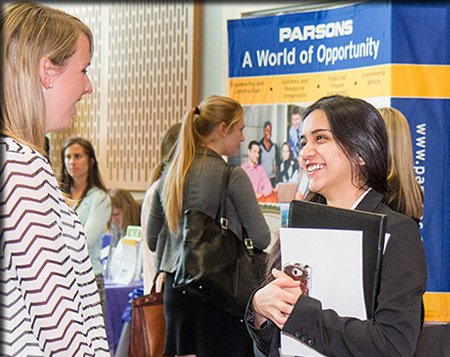 This year's career fair is the largest one to date, according to John Turbeville, assistant dean for student affairs and director of career services. "The job search process tends to be something students look at as intangible. When we host the career fair or any of our career workshops, it provides a physical representation of what the process looks like."